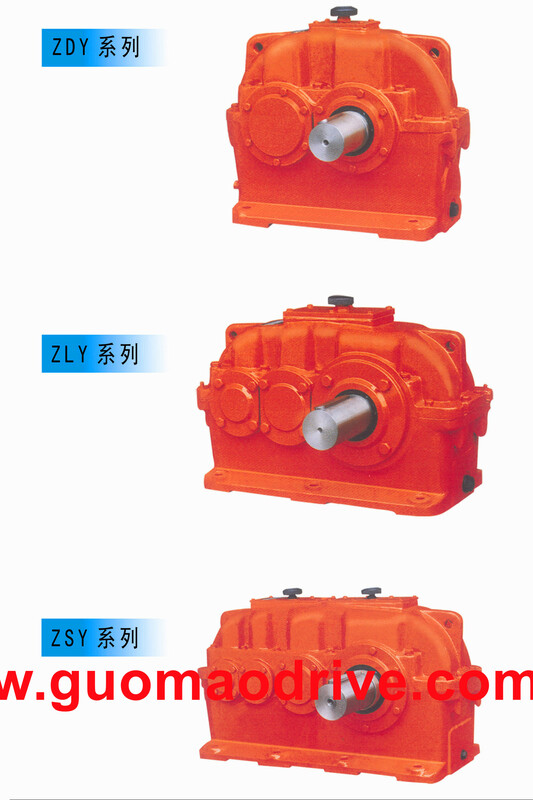 (2) spur gear reducer DCY series Can be widely used in metallurgy, mining, chemical, building materials, lifting, transportation, textile, paper, equipment, plastics, rubber, engineering machinery, energy and other industrial sectors. 1. The cylindrical gear reducer is carburized and quenched with high-quality alloy steel. The hardness of the tooth surface is up to 60±2hrc, and the precision of the tooth surface grinding is up to 5-6. 2, using computer reshaping technology, pre-reform the gear, greatly improving the load capacity of the reducer. 3, from the housing to the internal gear, using a completely modular structure design, suitable for large-scale production and flexible selection. The standard reducer models are divided according to the torque decrement form, which avoids power waste compared with the traditional equal division. 4, using cad / cam design and manufacture to ensure the stability of quality. 5, using a variety of sealing structures to prevent oil leakage. 6, multi-directional noise reduction measures to ensure the excellent low noise performance of the reducer. NER GROUP CO.,LIMITD., a professional spur gear reducer manufacturers, welcome to inquire. The hardened gear reducer improves the output torque by reducing the motor speed and using the gear transmission inside. However, the inverter changes the frequency of the alternating current in the motor; the speed of the motor is adjusted. Although the roles of the two are the same, when the inverter is used to reduce the motor speed, the energy saving effect can be achieved but the torque cannot be improved. Domestic relatively powerful inverter manufacturers include Pujiang Electromechanical and Taiwan City State.